The two chairs in this entry came to me in need of new caned seats. No finish work or repair was needed but the customer did ask for the new cane to be toned to look oxidized. The photos below are of the process of toning the cane. This is done with a stain in an aerosol container which is applied to the cane. After the Stain has dried thoroughly then a clear coat of Shellac in an aerosol container is applied to seal in the stain. On a side note, I am always amazed in this business how pieces come in waves. I will get several jobs including caning at the same time for example. In this case though, I looked on the bottom of one of the chairs and found a tag that read Grand Ledge, MI. This is the same town where the Crawford Chairs in a recent entry came from. 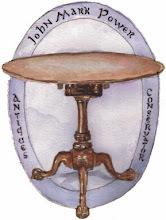 These chairs were probably made by the Crawford Chair Company or by the Grand Ledge Chair Company, of which Crawford was an off shoot. 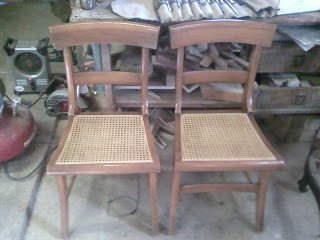 In this photo the chairs are seen with the new cane before it has been stained. 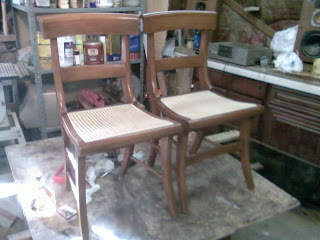 After masking of the chairs I applied the stain followed by a clear coat of shellac to seal the stain in. 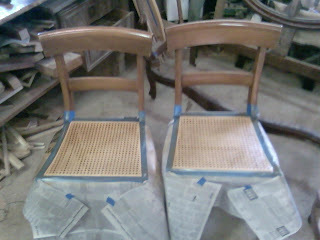 Here is a photo of the chairs with the new cane toned to look oxidized.